How can scientists actively engage with the media? What does it actually mean for scientists to engage actively with the media? For most scientists, I think the scientist-media model looks something like: 1) Publish ground-breaking paper in top journal. 2) Wait for university press office to write press release and maybe contact you. 3) Wait for phone calls and e-mails asking for interviews. 4) Answer questions. 5) Sit and wait for articles to be published while experiencing a mixture of nervous excitement and dread. Interactions between scientists and journalists need not be characterized by mutual frustration (or boredom). 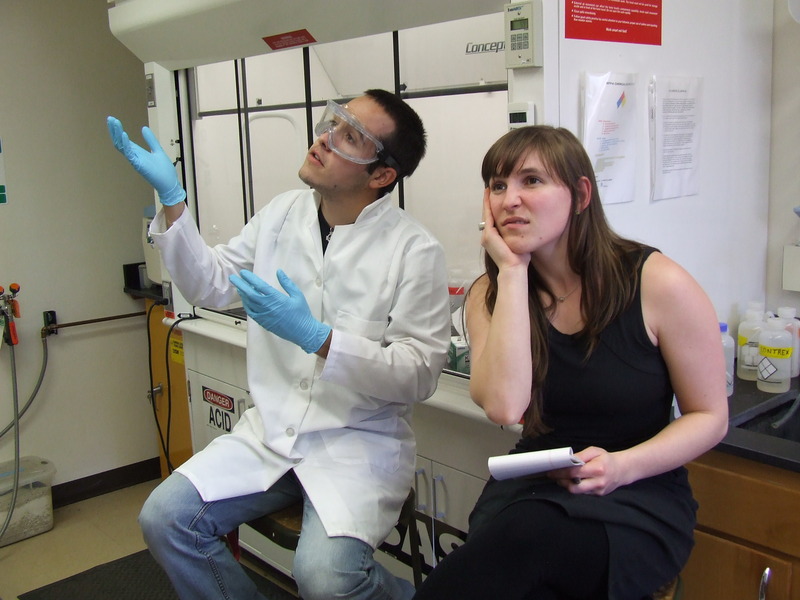 (Thanks to undergraduates Chad Zirbel and Grace Schellinger of the Williams Lab, portraying the Scientist and Journalist). Photo by Jacquelyn Gill. Is that engagement? Not really– I’d argue that that’s a pretty passive process. Engagement, real engagement, would be more fulfilling and would ultimately better serve both scientists and journalists– which means it better serves the public, too. 1) Cultivate relationships with journalists you trust. Not all science writers are created equal. The next time you read a particularly good (or bad) piece, make a note of the byline. Keep a running list of people whose coverage you like, and those you’d rather not talk to (and yes, it is okay to say no to a particular journalist if you’re uncomfortable with their coverage). Join Twitter– I can’t emphasize this enough– and start following science writers. Participate in the online conversations, in blogs, article comments, and in social media. The changing face of science communication is being deliberated right now, and we scientists should be a part of that discussion. Develop a reputation as a scientist who is interested in communication and is an effective communicator. Get to know your university media team and who your local science reporters are. Attend workshops on outreach and communication, and network with other science communicators. 2) Understand the culture of journalism. It’s really important for scientists to understand the constraints that media operate under. Many journalists can be fired for showing scientists copy (as opposed to scientists, who are used to their work being read and vetted by a number of people prior to publication). Journalists have very quick turnaround times (maybe hours or days) compared with those scientists routinely work with (one year in review? Really!?). Journalists– or, the good ones, anyway– often have a much better sense of what message will be of interest and the best way to communicate that in an accessible way, and it is worth listening to them in this regard. Journalists may see scientists as biased or having a particular agenda that may differ from their own– while I don’t believe that journalists are immune to bias or agenda, and think that we ultimately share more in common than is often portrayed when it comes to desired outcomes of science reporting, I do think that the more we can familiarize ourselves with one another’s perspectives, the better communication will ultimately be. The scientist-journalist interaction can be mutually engaging, fun, and informative! Photo by Jacquelyn Gill. 3) Don’t be afraid to approach them. Many of the scientists I talk to on a regular basis don’t think their work is of interest to the media (or the public)– maybe because they work with un-charismatic organisms, in non-exotic research systems, or on some highly theoretical or obscure aspect of their science. Others assume that if their work isn’t published in the Big Three (Science, Nature, PNAS) that it’s not of interest to journalists. While it’s true that the press packages and embargo websites associated with top journal articles make high-profile pieces easier to cover, that doesn’t mean that your work is less interesting or important if it’s published elsewhere. One recurring theme I’ve heard as I’ve followed the scientist-media conversation is that journalists want to get away from “churnalism”– the endless cycle of recycling press releases for the Paper of the Week, so that all coverage starts to look the same after a while. Long-form, context-driven pieces are increasingly popular, which opens the possibilities for new kinds of science reporting. Try inviting a journalist into your lab or the field, let them know about talks you’ll be giving or interesting work you’re doing, even if it’s still in-progress. Pitch an idea for a piece to a magazine editor, or write it yourself! Journalists don’t always know who to talk to, or have the context for a particular idea’s development through time. By acting as liaisons for science, we can give them that. 4) Make the journalist’s job easier. Make your papers available– if your piece is behind a paywall, that makes covering your work all the more difficult, especially if you don’t have a Big Three press package. Write a press release of your own and put it on your website or blog. Seek out media training in workshops and classes– make communication a priority in your professional development. Journalists want to find scientists who know how to communicate effectively. Before an interview, prepare your message in advance, including sound bites and metaphors (I cannot overemphasize the importance of metaphor in effective communication). Shyness or fear can be perceived as arrogance, so work on being open and confident. Participate actively during the interview– don’t merely redirect by ignoring a question and repeating your message like a mantra (this goes contrary to what many of us are taught). If a journalist asks a poor question, let them know what a better one might be, and then answer that. Be your own advocate: ask them to summarize your message in their words to get a sense of how well they understand you. Provide context. Protect yourself: know that anything you say can end up as a quote (there are conflicting opinions on whether it’s truly possible to speak off-record, so keep that in mind). The better-prepared and engaged you are during the interview process, the more likely (in my opinion) you are to be happy with the outcome. 5) Engage with science writers after the piece comes out. If something goes wrong, instead of ranting on Twitter or a blog post, provide constructive feedback to journalists directly after a piece comes out. Let them know what worked, as well as what didn’t (letting people know what they did right is really valuable, too, but is much less common). Offer polite corrections to factual errors or misspellings. For larger problems, like interpretation, understand that there may be more than one way to contextualize your work. Don’t be afraid to engage, but understand the constraints the journalist may be under. If it’s not possible to change the piece (or the journalist refuses for whatever reason), you can leave a clarifying comment or even write your own blog post, but remember that the ultimate goal here is making your work accessible to the public (the voting, tax-paying, policy-making public), not to thrown a journalist under a bus as a cathartic exercise. 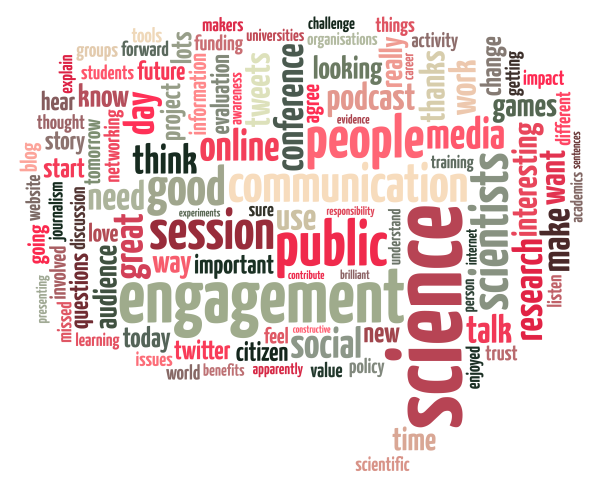 Tweet-cloud by @andrea_fallas from the 2011 Science Communication Conference. 5) Be your own science journalist. Blog posts can be excellent ways for journalists to engage with you in conversation, or to see the broader context behind your work. Blogs can help establish us as an approachable expert actively engaging in communication, which makes us and our work that much easier for science writers to find. Posting field notes from your latest expedition or even an exploration of your research ideas may inspire someone to contact you to do a piece on your work. Even the info-dump posts help educate science writers and the public on our jargon, methods, and the broader scope of the problems we work on. I do think it’s important for journalists to realize that there are cultural and institutional barriers to scientists talking with the media. Many of us are actively discouraged from engaging in media outreach by our department chairs or our advisors (though this isn’t the case with me, this is a very real phenomenon). Many scientists get no media training as part of their professional development (though this is improving), and have absolutely no experience or sense of how to communicate their work to a lay audience. Studies that could be potentially controversial either in the public or within science can trigger hate mail. Also, many of us who do engage have had bad experiences– and by bad, I don’t simply mean that we’re annoyed by simplification: I mean egregious errors in fact or extrapolations (a la “this will cure cancer!”) that can have serious impacts on how our work is understood by the public, and how our colleagues view us. Scientists who do media well can be looked down on as media darlings, putting message and fame above doing good science. There is some truth to that, in that we can’t all do everything well: science communication is only one of many things scientists must do daily– including science, writing, teaching, grant-writing, administration, training, and mentoring (not to mention having a life). Scientists face very real time constraints, and there have to be multiple models of what it means to do communication well that accommodate different levels of engagement. Do I mean that these are good reasons for scientists not to engage with the media? Of course not– but if journalists want us to engage, it’s important for them to also cultivate scientists’ trust as well, which means understanding our constraints, concerns, and limitations. Ultimately, I feel that the time I’ve spent with journalists and doing outreach has been very rewarding. I’m frustrated and saddened by what can often feel like a lack of progress in the scientist-versus-media debates, but feel that ultimately this conversation is helping science communication to improve overall. I’m weary of over-simplistic “scientists are arrogant!” and “journalists are shady” rhetoric, and genuinely feel that the best way forward is for each of us to start understanding and validating one another’s professional cultures, and to identify places where our practices could be more accommodating to one another. I would even venture to suggest that scientists are in a good position to facilitate this, given that we are more readily able to straddle the lines between the practice of science and science communication (says the blogging scientist). I urge my fellow scientists to actively engage with writers, and to try writing themselves; there are many strong arguments to do this, which I didn’t get into in this post, but ultimately we stand to benefit from being more engaged. As scientists, our time and energy are limited; let’s strive to make our interactions strong, productive, and meaningful. Many thanks to @scicurious and @_ColinS_ for helpful conversation in 140 characters or less! *It turns out that this message was an oversimplification of a statement by Ed Yong (@edyong209), who urged scientists to engage with journalists rather than posting angry tweets or blog entries criticizing coverage. The tweet version triggered a discussion of how scientists should be reaching out to the media and cultivating relationships with those they trust, which turned into the focus of this post. Jacquelyn, I recently found this and I want to thank you for putting words to something that’s been percolating in my mind for a while and frustrating me deeply. These are such important points. I just came across this excellent post. Nice job! Coincidentally, I have two of your three books (Don’t be Such a Scientist & Am I Making Myself Clear) sitting on my desk now. I’ve read the former; just starting the latter. I opened this post the other day and finally got to reading it – thank you so much! So much of what you say is great for scientists to understand. I wrote my own similar post (but not as complete as yours!) when Seth Mnookin and I were talking about the pros and cons of journalists doing fact-checking or seeking explanations with sources after the copy is completed. You’ve inspired me to dig it up and post it. Your point about journalists potentially losing their jobs for sharing pre-pub content is spot on and a representative thing that we scientists should learn about the journalism culture. I very much concur with your recommendation of Cory Dean’s, “am i making myself clear?” Got to meet her this summer after I had read the book. She’s incredibly encouraging of practicing scientists engaging with journalists. Just be aware that writers are not press agents or your own PIO. Jacquelyn, a very pertinent post and an insightful read, which makes many great points. Scientists of all specialties would do well to read this from top to bottom. I’m glad you found it helpful! I enjoyed your post, as well, and thanks for the signal boost. You covered some of the how-to aspects that I didn’t go into in my post, as I was more trying to focus on active engagement, rather than stuff that’s often covered in standard media training. You’re absolutely right that seeking out formal training is really important– there’s really no substitute. It’s a lively and loaded topic which we could easily squeeze regular mileage out of! Bottom line though, which you also referenced: it’s the relationship-building that matters. Many organisations, PRs and executives that I have media trained, or consulted to, often cannot see beyond a media release! This is a well written and thoughtful post, but one very important point is only obliquely addressed (in section 5). Reporters often become aware of scientific research through channels other than the news cycle of universities’ press releases. According to a friend who is a writer for livescience, their articles are often written to provide a scientific angle on current events. In these cases, if a journalist lacks a pre-established contact on that issue, he or she starts typing search terms into google. So, I think either for individual scientists, university departments, or research organizations it is extremely important to keep a regularly updated, clearly worded and organized, and visually interesting online presence related to one’s work and results. I know far too many university-level scientists who put nothing more than a CV, list of publications, and overly technical description of their work on his or her webpage. For the deadline’s my friend operates under, pages flush with easy to parse and understand information are a godsend. This book explores some of the issues you described articulately. Thanks for writing this so clearly, this may come in handy on my MSc Sci Comms course… Especially as the next 3 days are devoted to Science, the Public and the Media! I think an important sixth point is: get your organization to pay for some media training if you’re a scientist who’s going to engage with the media and refuse to do interviews until/unless you’ve had the training. If you discover in the course of the training that you don’t have what it takes to be a good spokesperson (surprisingly, patience is the top quality I’d cite, rather than being articulate), either work harder on it or choose someone from your organization who doesn’t become impatient at repeating the same thing three or four different ways and hundreds of times.